Some reviewers have compared this book to a Jane Austen novel. Austen’s novels clearly reflected the middle-class values of her time. What values are most important to the people of this book? Decide on five and list them in order of importance. Does this novel use the classic love story plot of Boy meets Girl, Boy gets Girl, Boy loses Girl, Boy gets Girl? Can you identify where each major change in the relationship occurs? Do you think it’s significant that Barry and Justine begin their relationship in a plane crash? Is it symbolic? In what ways does author Valerie Block reveal Barry’s character? What does his love of Beatles music show about him? Why do you think Justine is so attached to the film, The Sound of Music? In what ways are Justine and Barry different? In what ways are they similar? Is it important that Justine and Barry are Jewish? Is it essential to the story, or just a superficial element? In the same way, the story takes place in New York. Would it work just as well in Chicago? Do you think Barry and Justine have a better chance at sustaining their relationship than their parents did? A subplot revolves around Pippa and Vince, who don’t end up together. Why not? Vince, who has a major role early in the book, fades out of the novel. Do you think this is a flaw? What is the significance of the death of Justine’s grandmother, Miriam? How does it change Justine? At the end of Chapter 17, what is the meaning of the last line, “God was a research psychologist, and he, Barry, was clearly in the control group”? 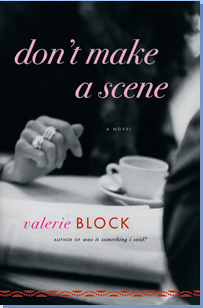 Why do you think this book is titled “Was It Something I Said?” What makes this novel so much fun to read?